I made these two lunches on different days, but both of them share the 'LOVE' theme as Valentine's Day approaches, so I am posting them together. I included a strawberry pancake muffin in his lunch box. It was from my freezer stash, I heated it in the microwave for a minute. Muffins can also be thawed in the fridge or at room temperature for a few hours. Pancake muffins are one of our family favorites and I have a very easy recipe which I'll share in another post, after Valentine's day. 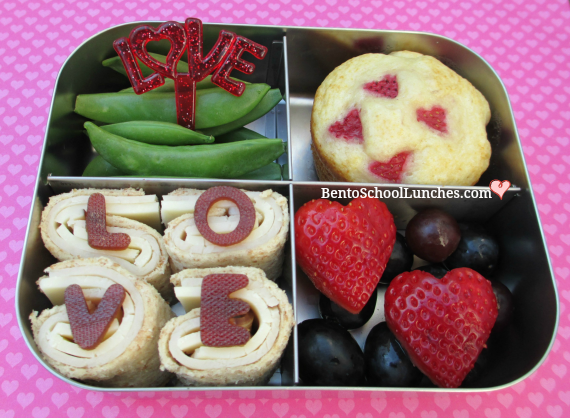 In addition he had roll-ups, which he seems to really like, to which I added lettering cut from fruit leather, sugar snap peas with a pick, seedless grapes and heart shaped strawberries. This lunch was packed in a Lunchbots Quad. 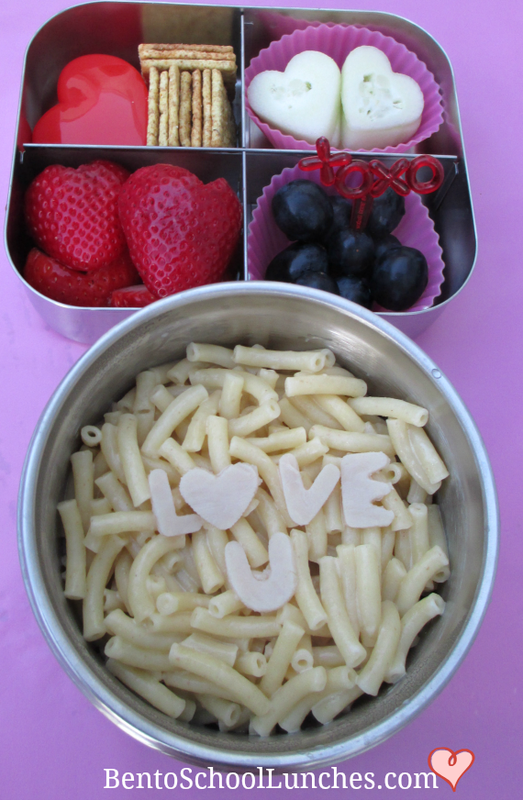 Here is the macaroni and cheese lunch with "Love U" organic turkey breast, and I used a small heart shaped cutter for the"O". Annie's organic 5 grain elbows and white cheddar is delicious. His side dishes in a Lunchbots quad were wheat thins, sunflower seeds in small heart shaped container, heart shaped cucumber slices, strawberries cut into heart shapes, and seedless red grapes with a xoxo cupcake pick. His Mac and Cheese was packed in a Lunchbots insulated container. Love both lunches! The mac and cheese looks so yummy! Both are lovely and yummy!